The circuits program for 2nd and 3rd graders can be divided into two main parts. In the first part, we taught the students the basics of electricity such as Ohm's Law, parallel/series, conductors/insulators, etc. At the end, they were given a quiz to assess how much they've learned. For the second part, students worked in groups of 3 on Design Challenges and presented their final projects at a science fair. Minimal guidance was given to them for their final projects as students had to rely on logic and their newly acquired knowledge to solve the problems. Explain the principle of operation and application of the circuit built. Draw the circuit diagram of your project with appropriate symbols. For alarm box and speaker, you can draw a box with the name as a symbol. List out each component used along with its definition/use. Below is our weekly schedule including all the lessons that were covered in the course of this segment. 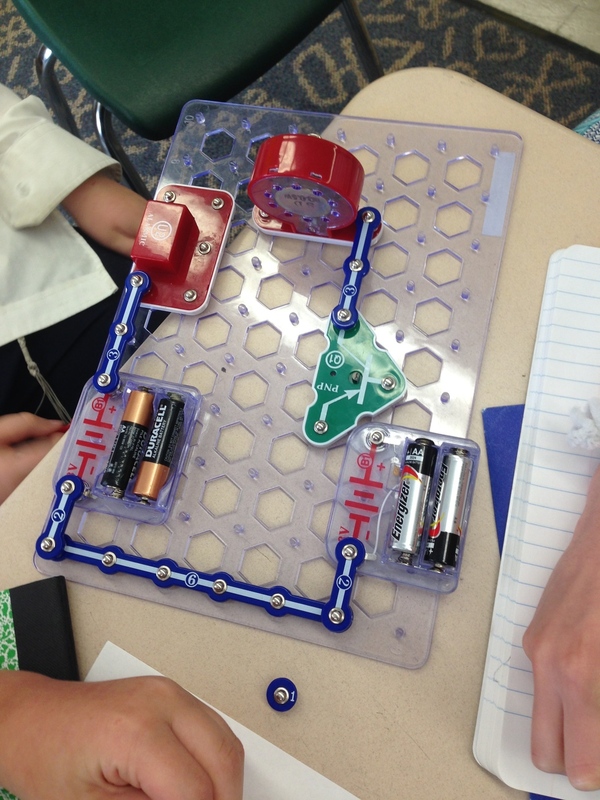 The method we followed was to cover the lessons first and then let students play with the circuits. Lesson 3: Series and parallel circuits. Click here to view an optional video. Below listed are the students notes for every week. Light Alarm Group: The Design Challenge for this group was to create a circuit where the light turns on when a 'burglar' trips a wire. When the wire is attached, the light stays off. This project required the use of a Silicon-Controlled Rectifier (SCR). While we did not teach the students about thyristors, we did give them a worksheet to help guide them. This may have been too difficult for their age group, and required a lot of mentoring. Flooding Alarm Group: This group created a circuit that sounds an alarm when the two cables touch water. The students were stumped at first, and we had to explain to them that water can conduct electricity. The students had some initial difficulty with this project, but were able to solve it quickly within a few weeks with barely any mentoring. They were the first group to finish, and were done several weeks before the other groups. Initially, their alarm was not very loud so we challenged them to make it louder. There were multiple ways of doing so (putting the cables in a different spot, adding another battery, using a transistor) and we gave them a worksheet about transistors to guide them. However, they figured out they could just add another battery. LED Display/Alarm Group: This group decided to do their own project. They wanted to have the Alarm Box make a sound depending on what number is shown on the LED display. After a few weeks of them struggling, we gave them a worksheet that helped simplified their problem as the LED display is complicated to use. However, this group was very independent and decided to just continue working on their original circuits. In the end, they were successfully able to make the Alarm box play a sound when the LED display shows a number. Below are our weekly lesson plans for the first segment. We also included our notes on what went well and poorly during these lessons. Each lesson plan is around 45 minutes long. 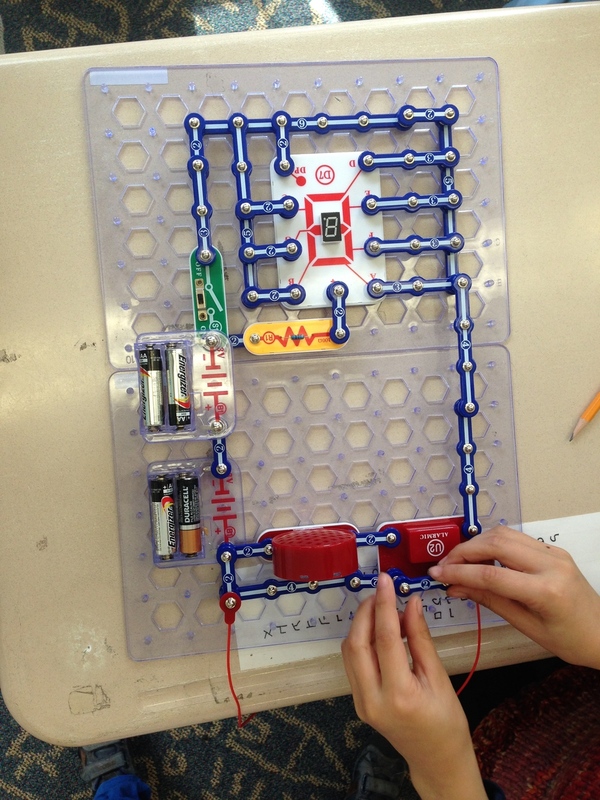 Generally, we would start with the lesson and then let the students use the Snap Circuits in the remaining time. Week 1: Introduction, Atoms, and Electricity. Week 2: Fundamentals of Circuitry. 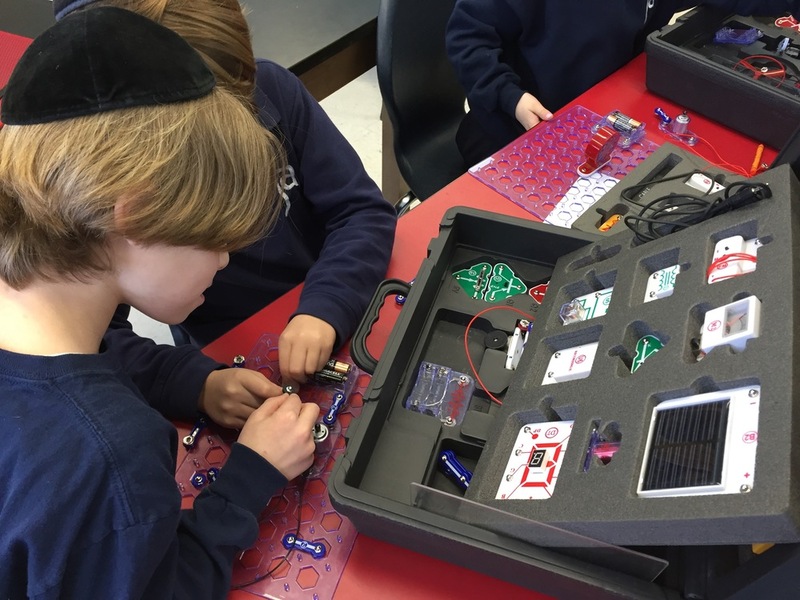 Students were taught about batteries, wires, switches and closed circuits. They then played with the circuits in an attempt to make a simple workable circuit. Week 2: Does this circuit work? Week 3: Voltage and Current. Week 4: Resistors, Ohm's Law, Insulators, and Conductors. Click here for the Design Challenge Sheet. Week 7: Students were given a short review for the upcoming test. Students played a jeopardy-like game where they picked numbers and had to answer the corresponding questions. A short demonstration of static electricity was also given as requested by a student. Click below to access the student notes for each week. Click below to access the homework for each week. Introduce more design challenges that relate to transistors and capacitors. Static electricity demonstration will be incorporated in the first lesson. Have the students use more math especially concerning Ohm's Law.